ROYAL CHUNDU is a new 5 star lodge situated 50 kilometers upstream from Victoria Falls on the banks of the mighty Zambezi River, overlooking the majestic river and expansive bushveld beyond. Incredibly, Royal Chundu is positioned on a piece of untamed Africa with rapids protecting it up and downstream thus granting guests 15 km of unspoilt and private river usage. Spacious suites and public areas masterfully blend colonial elegance and African charm, offering luxurious accommodation in 14 beautiful suites. 10 are perched on the banks of the Zambezi, while 4 private suites with their own lounge, dinning and pool area are located on Katombora Island, 4 kilometers upstream from the main lodge. Suites are exquisitely decorated, reflecting a bygone era of comfort in the wild. Start your day on Katombora Island where a walk brings you closer to nature, or enjoy the tranquility and awe of a river canoe followed by a pampering at our floating river spa. One can view and experience Africa�s magnificent wildlife during a day trip to Chobe National Park in neighbouring Botswana. The option of experiencing one of the natural wonders of the world, during a picnic outing to Victoria Falls is an absolute must. Choose to dine indoors in true ethnic elegance, or experience open air dining in the Chief�s boma, where you will be treated to an authentic African barbeque and traditional song and dance. 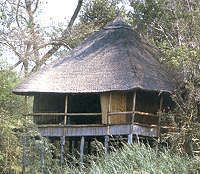 CHUNDUKWA is situated about 30 km upstream from the Victoria Falls. The Tree Lodge comprises double tree houses complete with bathroom en-suite and offers breathtaking views of the Zambezi River. For the adventurous Chundukwa will arrange white water rafting, bungi jumping, microlighting or helicopter flights and elephant-back safaris. One, two or three day canoe safaris on the Upper Zambezi is another option offered by Chundukwa Adventure Trails. 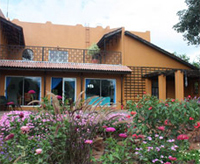 Other activities include day walks, birding, horse trails and excursions to Victoria Falls. PRANA is conveniently located just 15 minutes drive from the mighty Victoria Falls & Livingstone, yet far enough away from the hustle & bustle of town to truly relax, unwind & rejuvenate in this very special corner of the world. Prana's tranquil environment on top of Livingstone's highest ridge is enhanced with water wise gardens, an abundance of birdlife & over 50 types of indigenous trees. It is perfect for families & groups travelling together & with a capacity of 20 people in the camp and 8 in Prana House, you are ensured personalized service throughout your stay. 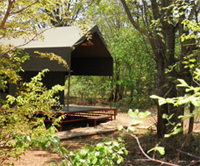 Each en-suite tent has been carefully positioned to ensure privacy & a very real experience of the African bush. They have two single or one double bed with mosquito nets, fans & solar heated shower. Each tent is tastefully decorated to guarantee your comfort throughout your stay while still enjoying a camping experience. A small covered patio outside each tent provides an area for you to sit & enjoy our varied birdlife, watching the magnificent sunsets & gaze in wonder at our incredible night skies.